The advent of stimulus funding has tweaked the way healthcare organizations go about selecting a technology companion. As the American Recovery and Reinvestment Act (ARRA) and its subset the HITECH Act near the one-year mark, HIT vendors, consultants, and health system technologists are prepared for their effects to grow substantially in 2010. 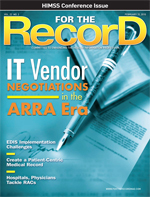 The legislation is expected to greatly accelerate what had been a slow but steady pace to EHR adoption, making it all the more imperative that healthcare organizations take the right approach when it comes time to purchase a system and negotiate with vendors. The catch, of course, is that most hospital executives can’t wait five years. They must start evaluating and selecting system components quickly, in almost a land-rush scenario in which vendors and consultancies—some with years of healthcare knowledge behind them and some with little to no experience in healthcare—are entering the market. Negotiating contracts in these new times will call for a mix of tried-and-true due diligence along with a careful parsing of two elements: vendors’ and consultants’ offerings and the likely tightening of amorphous passages in the HITECH Act. One industry expert says the best way to ensure a smooth contracting process may be to deemphasize the contract. Instead, says Celwyn Evans, founding partner at Greencastle Consulting, a hallmark best practice is to consider the contract a guideline; the real work will be done in establishing strong relationships with vendors and, just as vitally, with nearby peers. Evans says one contracting best practice—“which some CIOs do well and some not so well”—that predates the HITECH legislation is to establish and take advantage of a peer network. “What I mean is reach out to the individuals in your network to see who purchased this particular piece of software. What do they like, how did negotiations go, what sort of concessions did they get? I can’t emphasize that enough from a best-practice perspective. Reach out to folks you know and talk to them,” he explains. Failure to do so could mean an executive would miss out on the dynamics that a peer has had with a prospective vendor, he adds. Evans, who suggests both formal and informal methods when building a peer network, recommends making use of organizations such as HIMSS and attending local roundtable discussions. Johnson’s observation touches on one of the most crucial elements of building the HIT architectures necessary to take full advantage of HITECH: the meaningful use clauses that mandate the “electronic exchange of health information to improve the quality of healthcare, such as promoting care coordination” and electronic reporting capabilities. The exact definitions of meaningful use, the exact method of EHR certification, and the ultimate certifying body have been massaged but not finalized. Linda Reed, RN, MBA, CIO of Morristown, N.J.-based Atlantic Health, says she has asked vendors to adhere to the law as is. “I’ve told them, ‘OK, I don’t want you to say you’re going to be CCHIT certified. I want you to say you’re going to be HITECH certified.’ I actually did get a HITECH clause in two things that I bought,” she adds. Steve Fox, senior partner and chair of the IT group at the law firm Post & Schell, says such strategies will be critical to an implementation’s ultimate success. For instance, he says vendors’ guarantees that their platform will meet meaningful use thresholds should be discounted. “I’d be surprised if [satisfying] the final regulations will be achieved by a vendor doing anything,” he says. “Ultimately, it will be up to individual physicians’ offices or provider organization to achieve meaningful use, and in order to do it, they will need that vendor’s help. I have to laugh when I see those guarantees, ‘If you buy our product, you’ll achieve meaningful use,’ because nobody can make that claim. On the other hand, the failure of the vendor’s product can cause you to fail to achieve meaningful use. That’s why it is so important that you have tight provisions in the contract saying that whatever you want that vendor’s product to achieve, it will meet those particular objectives. “Many vendors use the phrase ‘We don’t know what we don’t know’ as a way to say they can’t try to comply with future regulations, but our position is if you are in the HIT arena, you have to agree up front to comply with whatever they are,” he adds. To get the most from ARRA stimulus funding and to avoid the penalties on the back end for failure to get a sanctioned EHR up and running, it is vital that organizational leaders create a blueprint of anticipated milestones, assess the business process changes that will accompany the new technology, and then approach vendors accordingly. Reed says every organization should have as full an assessment as possible regarding its current software and hardware platforms, interoperability capabilities, and availability of organization staff to evaluate and upgrade its architecture. Of course, many provider organizations lack the IT expertise and their clinicians don’t have the time to perform these assessments in-house. Johnson says numerous consultants have approached him regarding ARRA preparations and that commonsense evaluation, such as obtaining references, speaking to customers, and looking for telltale signs a prospect is not particularly well versed in healthcare, can go a long way toward finding a good fit. Once those baseline milestones are calculated, Reed says smart strategizing now could help CIOs find technology bargains they may not need for several years but which vendors may include in a bundled product. For example, she says vendors’ assessments of Atlantic Health’s technology needs for the next several years included applications she knew were not critical in meeting the initial meaningful use requirements. Some she discarded as unnecessary “bells and whistles” for both short- and long-term needs, but others she used in trying to leverage negotiations. One such application is a nursing care planning platform that Atlantic Health will need to adopt in a medium-range timeline. Both Reed and Johnson also say that assessing the length of contracts requires a creative approach. As interoperability becomes mandatory, vendors will have less leverage in trying to lock up long-term contracts for technology that integrates only with other platforms from the same vendor. Signing contracts for five years with renewal or automatically renewed “evergreen” options is becoming popular and allows more flexibility when assessing technology needs in a rapidly changing interorganizational architecture. If healthcare executives build a network of peers, gather general information on the available technology, and perform a careful needs analysis, then drawing up a contract shouldn’t produce too many nasty surprises—as long as they’re willing to stand fast in discussions with vendors, no matter how small their organization may be. Fox says healthcare executives should always ask for contract drafts in modifiable formats such as Microsoft Word (many vendors, he says, send them in formats such as PDF, which subtly inhibit the ability to redline unsatisfactory clauses), request materials such as PowerPoint presentations used by salespeople be included as binding supporting documentation, and reserve the right to halt payment if the technology is not working according to agreed-upon terms. He also suggests that a dispute resolution process be clearly spelled out. Fox recommends reserving the right to take a vendor to court rather than submitting to arbitration; the courts are publicly accessible and the threat of a public lawsuit can serve as an incentive to resolve issues more quickly. These types of safeguards predate ARRA, of course, but Fox also says some new cautions should accompany post-ARRA negotiations, such as specifying that failure to help an organization achieve meaningful use will cost the vendor dearly. “The typical limitation of liability clause will have an arbitrary limit and a claim that the vendor ‘under no circumstances’ will be liable for consequential damages,” he says. The loss of stimulus funds or the levying of penalties for failure to meet one of the HITECH stipulations could be interpreted as just such consequential damages, “so it’s important that the clients have a lawyer who understands this and is willing to negotiate very hard.” Should a technology fail to meet those goals, not only should traditional penalties be levied, but Fox says the vendor should also be compelled to pay some or all of what its client lost in ARRA incentive payments as a result of that failure. “That will be tough negotiating but important to look at,” he says. — Greg Goth is a freelance journalist in Oakville, Conn., specializing in technology and healthcare policy issues.